I understand that the Internet and social media sites can be an empowering place. It also has a powerful democratizing effect, which I value. That doesn’t mean that everyone’s voice ought to be given equal weight. Though it should be utilized with discretion, sometimes the most appropriate response is the back of the hand. Here is a case where this applies. This is for those of you who are convinced that the scholarship around the antebellum period, slavery, and secession is fundamentally misguided. My response to you: I DON’T CARE! That may seem a bit dismissive, but that is exactly what I mean to say. I am not interested in what you learned from reading the Dixie Outfitters website, The South Was Right or one of your other Pelican Press books. I am also not interested in your assumptions about what motivates academic historians. Your theories about how some vaguely defined political agenda influences research is of no interest to me. I’ve read a pretty large chunk of the scholarly literature on slavery and secession and one thing that has been established over the past few decades is that the South’s “peculiar institution” is central to understanding secession and the Civil War. The post photo includes just a small number of relevant books from my personal library. It’s not meant to make you feel insecure, but to give you a sense of how I approach the study of history. My understanding of this subject comes from reading these books, most of them written by professional historians. I spend a great deal of time reading books and journals, not because I’ve become seduced by the academic world, but because these books constitute my education in this area of history. You are going to have to do better if you hope to convince me that the broad interpretation that emerges from these studies is fundamentally flawed. If critical scholarship is not your cup of tea, so be it. Just please don’t expect me to take you seriously or imagine that I have any interest in your personal beliefs about Civil War history. We are simply on different pages. We have divergent ideas of what it means to engage in the study of history. In the end it’s not a big deal. You are free to discuss your personal beliefs on your own webpage or Facebook site or wherever you can find like-minded people. Huzzah, sir! A bold statement rightly made. How sad to base one’s views on actual history and research of that history by utilizing actual historians and historical facts. Well said. 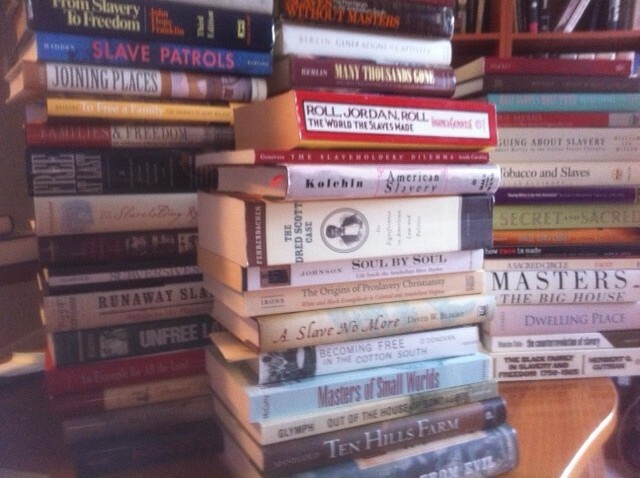 It would be interesting to compare our stacks I think one thing to emphasize is that a lot of the reading includes reading books and documents from that era, ESPECIALLY from advocates of slavery and advocates of the slave states’ seceeding/nullification. I don’t agree with these advocates; I find their views to be unsettling at best and repugnant at worst. However, they appear to have been literate, articulate individuals. The crisis that culminated in secession and, thus, the Civil War did not happen out of nowhere. That storm had been building since the Constitutional Convention, at least. These advocates had a long time to hone their arguments and decide what they wanted to present to the world and to themselves about their position. I prefer to take their word for why they did what they did than those who think the Kennedy Brothers, Thomas DiLorenzo and a politically-driven online dry goods store know better. *BEAUTIFULLY* stated! Do you mind if I print that out and pass it around to a few folks I know (including the history major who just started working with me, who looked at me with a straight face last Thursday and archly said, “Well, you know it’s amazing how many people think that slavery was central to the Civil War when most educated people know it was about states’ rights.”)? And from what august institute of higher education did this worthy graduate from…Ole Miss? Oh, and Kevin as far as teh central theme of the post. Sounds like you’ve been afflicted by a particularly noxious series of communications this week. Amen to that but it’s sad that you have to say it. And I agree that the two disciplines employ different methodologies; however, the principle is the same. We operate within a certain set of guidelines as to how new scholarship is created, shared, and evaluated as opposed to pulling bits and pieces of information from random places that conform to prior assumptions. I totally agree. As I have become more and more of a “serious” historian, I am struck by the similarity of the two disciplines. One thing to note before we move on are the wonderful books that Kevin has in his library such as Don Fehrenbacher’s work on the Dred Scott case, which brings to mind one of my favorite books that Prof. Fehrenbacher finished, Potter’s The Impending Crisis. Perhaps if he were so inclined, Kevin could write a post, inviting people to post their favorites. Case in point- a close friend got hooked on ancestry.com and learned of his grandfathers who fought for the Confederacy. So, what did he do? He joined the SCV because they seemed to offer the best way to learn why his ancestors served. I flipped through some of the several books he acquired and need not express my opinion. So, I tipped him off to the Gilder Lehrman lectures and to The Road to Disunion volumes. He and I will hopefully be making a Virginia Civil War road trip next month. I like the idea of a list of “must read” histories about slavery, secession and the Civil War. I’ll start off with William Freehling’s Road to Disunion volumes and James McPherson’s Ordeal by Fire. I concur with the other comments: well said (or perhaps, written). Your post raises a question for me though: how numerous are the people who refuse to accept the arguments of professional historians? Is there a possibility they are a lunatic fringe that really doesn’t deserve a lot of our attention and that our efforts are better used elsewhere? True there are still a lot of people who believe the war was about “states rights.” But in my experience they come across this view honestly, and mostly because they don’t care and are just repeating what they learned from their parents and grandparents who learned this when it was the accepted interpretation. They also don’t read anything, let alone scholarly books and articles that are likely to change their perception. In my own experience, when you explain the significance of slavery to these people they are ready to accept it. Perhaps we should all spend less time arguing with the lunatics, who will never be converted, and focus our energies on those that can be. It’s really nice to hear from you. Hope all is well. I agree with everything you’ve said here. I guess one of the things I was trying to point out is that the “debate” itself is taking place based on an entirely different set of assumptions as to what it means to engage in a critical study of history. A lot of these folks see themselves as defending a certain image of the past rather than engaging in a discussion of how historians have approached the subject or how the historiography has evolved. Many of these people are suspicious of academics, though most have never actually picked up a scholarly study or even understand how to evaluate a formal argument. Part of the problem is that academic historians have not done enough to explain to the general public what it is they do. A bigger problem is that the Internet has become a primary destination for people seeking information and as I have noted over and over these searches are done with little understanding of how to evaluate websites. There are people here who spend a great deal of time arguing with the “lunatics” but I have pretty much stopped given how little it accomplishes. We need to find ways to promote responsible and helpful discourse on the Web. Regarding the refusal of people who refuse to accept the arguments of professional historians, in a way the refusal reminds me of what Lincoln wrote to Thurlow Weed following his second inaugural address, i.e. that “men are not flattered by being shown that there has been a purpose between the Almighty and them.” In other words, people do not always like to know that the facts may be otherwise. As far as professional historians not telling their story or explaining what they do, should that not be evident? It smacks too much of marketing. Ultimately you may be right but it doesn’t make it any more pleasing. Next post: Is Richmond Burning or Beginning Anew?